With the Thirty Meter Telescope hearings held just the other day, I keep seeing comments about it being a symbol of oppression to the sovereignty activists. It makes me so sad to hear this when we live in a society where we have the freedom and liberty to pursue our dreams. How is it that people can’t see this? If the TMT leaves Hawaii, the entire state loses an opportunity to be a part of cutting edge technology that is global. Not only are we at a loss of technology, we’d lose out on the educational funds to help bolster the Big Island community. The other local businesses will lose as a result of the trickle down effect. In other words, everyone loses. If the anti-GMO get their way, the world is sent a message that this technology is dangerous. The poorest of farmers will be denied access to innovations that could boost their livelihoods and prevent more malnutrition in their communities. The world will also lose out on tools like Golden Rice, which could prevent suffering and death in very young children. As the population increases, the 975 million who are already food insecure will undoubtedly grow too. If the environmental industry succeeds in creating Hawaii’s ocean monument, an essential food source will be lost due to the lack of access to our waters. The people who can’t fish won’t have a commercial fisherman to provide this local staple for them. If I apply this definition on other issues, it’s clear who the real oppressors are. Without technology jobs, what other opportunities can our children hope for? Do we want them to be limited to just tourism jobs or do we want something more? I want my kids to have many opportunities to make Hawaii their home. How can we foster this scenario? We have to act now to push for educational opportunities. Without education, people will be oppressed and limited. Those who block the basic right to education are indeed oppressing those seeking a better future. We, the people of Hawaii, deserve better. Our children deserve honest conversations around investing in their futures. A very loud minority seeks to deny us the right to a better future through ruthless, dishonest tactics. I’ve asked them for their alternatives and none have offered anything to replace what they take. People who aren’t willing to collaborate on coming to an accord. It appears as if some prefer to stay oppressed when they reject progress or want to oppress everyone else too. I want to part of that. 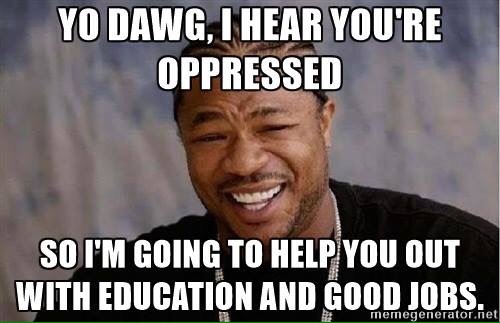 Willful ignorance of the facts and refusing to learn about what you’re talking about is also oppression. Self oppression. In yesterday’s Star Advertiser, Senator Brian Schatz came out in support of the expansion of the Papahanaumokuakea Marine National Monument. It’s interesting that he’s claiming to support Native Hawaiian rights. It’s good and dandy that he is supporting the Hawaiians, however, he is a United States senator, elected by the people of Hawaii. Should he not be representing the entire state of Hawaii, not just one class of people? What’s even more disturbing is how many activists have stated that the expansion would not affect the fishermen. Even Paul Achitoff of Earthjustice had replied to one of my comments on Civil Beat claiming that the monument expansion would not affect the fishermen. Now the latest announcement is that the Kauai longliners will be able to access the area they use. Now wait a second, wasn’t the environmentalists claiming that no fishermen were going to be affected and now they’re saying something else? Where does that leave the Oahu longline fishermen? High and dry? As I look closer at the funders behind this monument, it’s clear that this is yet another well funded, outside organization attempting to influence our ways of living here in Hawaii. The Pew Trusts are a huge proponent of the closure of these areas. Just who is the Pew Trust? It’s big money to the tune of $800M and it’s once again corporate made money that has turned to saving the earth. The money that funds the trust is from oil. Yes, it’s the environmentalists’ biggest enemy, oil, that is funding these ocean closures worldwide. The activists conveniently don’t disclose these facts about it. Should we be surprised that a person voted by the people is using big oil money to deny local people the right to fish the oceans? Nope. Senator Schatz has taken to rejecting evidence based policy before when he had a press release on the bogus Monsanto Protection Act. Schatz’s Monsanto Protection Act from Facebook. The link touting the conspriracy theory is gone from his page. My husband and I had a discussion about environmentalism the other day. He donates to a group and I refuse to. He said who is going to protect the earth? He, like so many others, is operating under the false assumption that any industry is guilty of not being environmentally friendly and that one must pay someone to protect it. Environmentalism sprouted in the late 60’s as a protector of the earth. The reality is that industry, like farming or fishing, are under very strict regulations that are science based. I’m surmising that once these regulations became strengthened, these non-governmental organizations risked losing their sustainability. Their next move was to form legal defense funds to use the courts and loopholes to fund themselves. After seeing the tactics being used, this industry is unregulated, not transparent, and not accountable for what they do. When I see the Sierra Club jumping on anti-GMO events, big money is at play here. Instead of supporting access to technology that can create a cleaner world, they want to take it away. There needs to be educated environmentalism here in Hawaii and globally. Is taking the very technology that can reduce inputs an educated stance? Is taking away ocean access from the very people who know it best a good thing while allowing foreign fleets access the wisest way to manage the area? Why does modern day environmentalism focused on extracting humans out of the lands and water? When Washington, DC and California elites come to Hawaii, they don’t understand how much we are intertwined into our environment. The local people love the beaches, the mountains, and forests. Saving the environment by taking us out of it isn’t reflective of even the ahupuaa system. The Hawaiian people even understood this but mainland groups don’t. What we are in dire need of is educated environmentalism that every person understands their place in this system. Environmentalism isn’t about creating work for people and helping locals make a living. Its focus is on shutting down farmers and fishermen and yet they talk about sustainability and self sufficiency. They very people they attack are doing that work but are becoming more and more impeded by the aloha aina attitude. As an elected official voted in by the people of Hawaii, Senator Schatz owes everyone in Hawaii fair policies based in evidence. President Obama also needs to include the people’s voice in his decision. America was the land of opportunity where we have liberty to live freely. Oppressing those who feed us and tying their hands without good reason, is the very thing we fought against. When saving the environment becomes intent on stripping access to resources and tools from people, we are losing our freedoms as American. A democracy was formed by many people working together to address issues. The anti-GMO, anti-TMT, anti-fishing and other anti movements are clearly anti-democratic. A vote for anyone who celebrates progress as taking away livelihoods, is launching a greater attack against the local people. The fishermen and farmers do more than just bring in food or grow Hawaii. They provide local food for everyone. They rely on others for supplies to do their work. That’s more people put to work. The fish turns to poke and helps chefs and restaurants showcase Hawaii’s unique flair. Simply closing one industry does not come without affecting others. The trickle down effect isn’t obvious but it’s there. Even more people are provided work through a fish or farm with their own employees having incomes to use at other businesses. Families will be affected without doubt. Hawaii families are already struggling here with the rising of living. Nearly 50% of people here live paycheck to paycheck and we are one of the worse states to do business in. Should we be surprised that we have so many homeless and one of the highest rates of poverty at 1 in 5? Should we be shocked to learn that meth use is rampant and having stuff stolen is common? The lack of funding for education will continue when there’s no taxpayers providing that income. No income means less tax funding for social service programs to help the elderly and homeless. Not caring for the people is not indicative of a progressive society. Being dishonest and unfair is not progress. Outsiders tend to mock “plantation mentality” but it was that mentality that helped get people cared for with medical benefits before it was a thing. However, that same mentality is keeping the local people from wanting to speak up. Let our Senator know that taking away jobs and local food is not okay. Every time you eat that poke bowl, just remember who helped make it for you. One day, you might only talk about eating it because no one will be fishing anymore and it won’t be because of no fish. 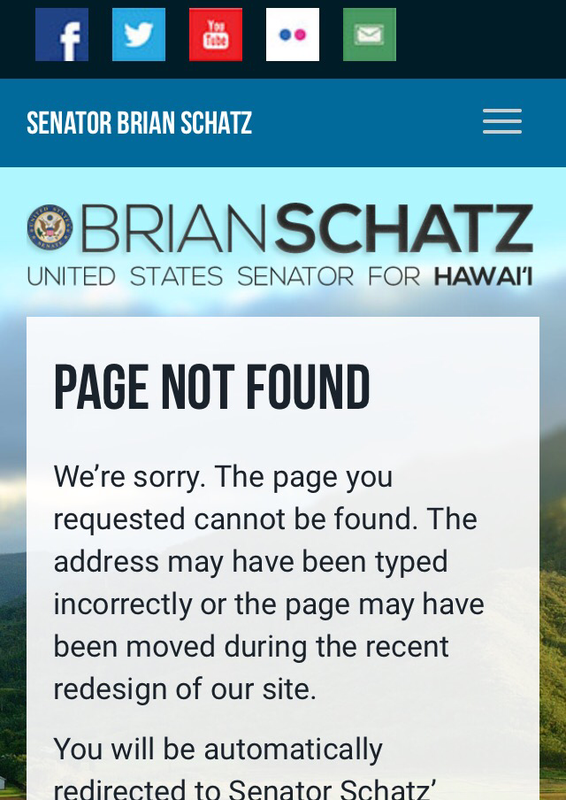 Tell Senator Schatz now that we want fair access to resources and fact based policies. The local folks deserve it! Instead of having a corporation to operate from, environmentalists have created a new model of using a non-profit status. It’s tax exempt and also their donors get tax write offs for their donations when you have a “good” mission to advocate from. The other great part about this model is that there is no disclosure required of the non-profit to show who their donors are. It’s not a taxpayers’ right to know who is funding these business ventures and non-transparent even though they demand transparency of others. While corporations are being criticized for being the doer of all evils and held to increasing regulation, the non-profits have free range to unleash any tactics available to get their way. There is no regulation on these non-profits and they aren’t held accountable for facts and do as they please essentially. There’s no repercussions for their actions and these groups have taken an extremist position. Like any extremist position, there is no ability to find common ground. People who take this position can only see one way. The Hawaii environmentalists are shouting “Aloha Aina” and “Malama Aina,” and see the need to fight to protect the land. Their belief lies in the assumption that man must be removed from nature to protect it. Man is a part of the land and we derive our life from the land. If we are removed from the land, how are we to survive? We are indeed a part of the ecosystem and can’t be ignored or removed from it. Like any extreme position, the ends justifies the means and that is what is unfolding here in Hawaii. That’s why the relevance of facts is useless in these debates, whether it be GMOs, TMT, or the Superferry for that matter. You can toss out any fact and there’s no accepting of it and it causes these activists to dig deeper into their positions. As long as you get your way, that is all that is important. When I learned about the plight of the fishermen, it made me realize that the tactics and messaging used is universal. The activists need a bad guy and will create that narrative. If you look closely, the repetitive arguments are pretty similar across the board between the issues and take the common thread that there must be a stop of this evil. Immediately, you’ll get a pop-up box stating that you should pay them money to help solve the problem. Give money now and they will save the world. No one ever bothers to crosscheck those facts and just simply believe because that is human nature. We like to simplify the issue in to soundbites and not look things up. Like the GMO issue, the environmental industry is attempting to use the aina to put people out of work and harm the families of those who work in the industry. When environmentalism is used to put people out of work, there’s a problem there. The attempt to remove the human factor from the ecology is problematic at multiple levels and unrealistic. Simply stating that if there is a loss of work to people shows the cold, callousness of these activists and the lack of empathy. Not only do these activists desire to take incomes away from people, they willingly show how they aren’t able to walk in the shoes of others. Like extremists, they don’t care about the harm that they create with their stances. It’s completely ignore regardless of how correct it is. Where in a democratic society is it okay to deny others the basic right to work? Denying that right only spells demise. The huge push for the closure of the Northwest Hawaiian Islands under the guise of the Papahanaumokuakea Monument isn’t any different than the ag issue. These folks love to play on people’s emotion and unsubstantiated “facts”to garner support. I caught this post on the Expand PMNM Facebook page touting a lot of “facts” supporting it. If you look closely at it, you can see there is no source to back up these claims. On top of that, they also play a video of a nice turtle swimming around in the ocean. It’s a great play on emotions and gets people wanting to take action. Who wouldn’t want to after reading the passage and then watching the video? Like the anti-GMO movement playing videos of “documentaries” and using a lot of fear imagery, the expansion of the monument sounds really good after being the delivered “facts.” Let’s stop and think about this more. Are those numbers touted really true and where’s the actual data set to back it up? Do you simply watch these videos and just believe or do you question the information presented? The facts do not support the need for the expansion of the monument. So then the support is garnered for the native rights issue where the land and oceans have to be protected for only Hawaiians. I have to think that the Federal expansion is occurring under a democracy. If that is the case, shouldn’t all the people of Hawaii have a say in this issue as it will affect them? Isn’t that a democratic thing to do? After that’s all been said and done, the last argument being made in support of this expansion is in the name of science ironically. If closing off the oceans is going to help preserve cultural values and advance science, why are some Hawaiians protesting the Thirty Meter Telescope of Mauna Kea? Isn’t the telescope going to help preserve the heritage and culture of studying stars and help to advance knowledge? If the oceans are being used in that way, shouldn’t the mountains also be used to celebrate the wonder of science and knowledge? With the Office of Hawaiian Affairs supporting the expansion of the monument under these same arguments, why does it change with Mauna Kea? The cultural practitioners have access to the summit with the telescopes thanks to the roads and no longer have to walk up there as in the ancient days, which was mentioned by Keahi Warfield in his video supporting the TMT. They have access to the many parts of the sacred mountain thanks to those roads that also built the telescopes. Hawaii is dealing with extremists that can’t work to collaborate with others. It’s their way or no way. That is creating dysfunctional communities and pitting friends against each other. We have our own political discord in our islands where the native rights are being fueled by outsiders who have no ties to the Hawaii communities because they don’t live here. Instead of encouraging community discussions and learning from each other to work on a plan based in common ground, it’s their way or no way. The native rights would sound more authentic if it wasn’t funded by outside interests. These are just a few of the outsiders who are using the environment to take away our local ways of living and they will do anything in their power to do it as we are seeing. They have spread misinformation on everything from GMOs, the Superferry, TMT, and now the ocean monument. They have lots of money that they don’t need the ferry like the local folks do. They don’t enjoy the fresh fish we get from our local fishermen. Neither has any link to Hawaii’s agricultural heritage either. They call themselves progressive but putting people out of work and romanticizing the ancient days is anything but progress. They use native Hawaiians as their vehicle to do this while tearing communities apart is anything democratic. Democracy means including all people in the conversations. Being rude to a high school student testifying in favor of the TMT isn’t democratic, it’s attempting to silence her stance and isn’t different from threats of crop destruction and burning of tractors. Attacking a facility up on Mauna Kea and damaging property and harming people in the name of protecting a mountain isn’t something acceptable in a democracy. Placing rocks on the road heading up to the summit in hopes of someone hitting it and getting into an accident isn’t an acceptable behavior in a law abiding society. Telling others who aren’t Hawaiian but have a stake in the access to oceans that they have no say not democratic either. Bernie Sanders, the presidential wanna be, touts communist values and yet his followers acts as dominators of the issue instead of treating their fellow man as an equal. The saving of the earth can’t be used as way to rob people of a way of living. That isn’t what makes a democracy. As I’m writing this, I have a knot in my throat because I’m sharing a story that very few have heard. I feel compelled to finally share it with others because I’m hoping that it may change hearts and minds because it’s about people who are near to my heart. The story I want to share is about my brother, Mike. Mike is 3 years younger than me and one of my best friends. We can talk about anything and we are very close. My kids adore their uncle Mike and uncle Frank, who are the kindest most loving people you can have in your life. As children, they can’t see anything wrong with two people who are in love because they see people and nothing else. Yes, my only brother is gay. I learned of him being gay over 2o years ago while I was was back for a break during grad school. Prior to me coming home, my sister had asked me to read the book by Chasity Bono, which I did since it was one of the top sellers. On my first day home, he brought his friend, Frank to have lunch. Both of them were acting a little strange but I didn’t think much of it. Dakine in pidgin is the equivalent of whatchamacallit and sure enough, my sister nodded her head in agreement because she knew that I had figured out what was going on. I was stunned. The little brother I knew and loved was gay and so afraid to tell me what his truth was. My sister and I just cried and cried after that revelation. I cried for not only the shock of him coming out but more so in fear for his life. My brother was a very happy go lucky kind of guy who sometimes was not as suspicious of others and I was afraid for him. My sister told me how his coming out made him feel so exhilarated about finally being at peace with himself that he was making new friends and opening up to others. Me, being the cautious protector of my siblings as the eldest, I still had that instinct to protect him. There had been several incidents where gay men were lured by others and killed in public bathrooms or in their hotel rooms just for being out of the closet, prior to his coming out in Hawaii. Not only was that happening but the story of Matthew Sheppard was still fresh in my mind and I was truly terrified that Mike would be a victim of this hatred. I just wanted to scream out against the hate that was killing people for being who they were. Other thoughts crept into my mind about him being the only son in an Asian family and going to a Mormon school where homosexuality was not tolerated. My dad’s only son would not be carrying on the family name to another generation which is a big deal for the Japanese culture. Mike could be kicked out of the college he was in and about to finish. I was scared out of my mind for him. My parents didn’t know that he was gay at the time so I had to hold all of my feelings in at the time. It wasn’t until I was back in St. Louis that I got the call from them of what they had learned. Our family was just in shock. My brother and Frank went on with their lives and we all got to learn about who my brother struggled to be for so many years. Even though he seemed happy before, he indeed had a newfound happiness that I had never seen. His happiness gave me hope and peace and the shock eventually turned to admiration of his bravery to be true to himself and really be happy. One struggle that remained with me was that I was not allowed to tell my grandparents that Mike was gay. I remember getting a call from my grandpa who had just visited Mike and Frank’s new condo that they had just purchased together. My grandpa was going on about how nice it was and the great dinner they had there during the housewarming party. This was our exact conversation that I’ll never forget. My poor grandpa just didn’t have the heart to ask my brother but felt comfortable enough to ask me and I couldn’t tell him. He never did ask my brother or Frank and passed away a few years later not knowing the truth but I think deep inside, he did know. Today, I had a wonderful day with my brother and Frank taking my kids and my sister’s kids to the beach. They have been together for longer than I have been married and remain a stable support for our family. They both love my children dearly and are adored back. We are all bonded by love. So why am I telling this story? The recent shooting of people in a gay nightclub in Florida brought back that terrifying fear that I experienced some 20 years ago. What if that was my brother or Frank who was in that nightclub who was an innocent victim of hate? How many families lost loved ones that night because of the hate being spread by people? I weep for their pain and loss. No one should lose a person to hate. No one. So where’s the sources of this hate? It’s coming from all over with religious leaders touting intolerance around the world across the social media. There’s no factual evidence to support this ideology and as history has shown, it’s deadly. The anti-GMO activists are also part of the problem too. Yes, this hobby activism of spreading misinformation has helped to fuel hatred and bigotr globally. A simple sharing of a link seems harmless, but it can have deadly consequences. “They’re Putting Chemicals In the Food To Make People Gay”. Mike Adams of Natural News also has frequently touted the claims that GMOs contribute to infertility. And then the Babes Against Biotech shared his links only to amplify this misinformation. The Babes posted so many of his links that it was hard to track all of them until others started mocking them and they stopped the sharing of these links. Alex Jones of InfoWars has also touted anti-gay messages on his site attributing it to GMOs. The Hawaii anti-GMO groups are all guilty of sharing these unfounded claims with the movie, “Seeds of Death” and Jeffrey Smith’s, “Genetic Roulette.” In the first few minutes of the film, it states GMOs causes infertility that is sourced to Hayes’ claims. Ronnie Cummins, of the Organic Consumers Association, is also featured in Seeds of Death making the same claim on his site. The director of many anti-GMO “documentaries” is Gary Null, who is a AIDS denialist, which explains his homophobic views. Jeffrey Smith was used as a Hawaii County expert on the anti-GMO bill and has been paid by the Maui SHAKA Movement too. Greenpeace has also led campaigns spreading the misinformation to the most vulnerable and least educated also. I wouldn’t be surprised that the same countries that these environmentalists have propagandized to institute GMO bans also ban homosexuality. The chemophobia being touted by the Pesticide Action Network and the Center for Food Safety are also leading to the claims of infertility which translates to increased homosexuality to the developing world. Meanwhile, CFS and IRT fear monger about GM foods and then sell their scared consumers on the Non-GMO Shopping Guide, which they don’t disclose can use the very same synthetic chemicals that they demonize. The farmers are also hearing these messages. Many African colleagues have told me that farmers refuse to grow GM crops because they’ve been told by wealthy activists that their children will be homosexual or consuming it will make one infertile. Mark Lynas has been witness to such claims. The chemophobia of pesticides isn’t just limited to atrazine. It’s targeted at glyphosate too now with claims of infertility by the same sources of bad information. None of these claims are backed by evidence however, the uproar is causing serious consequences across the world where countries are banning its use. Should we be surprised that this information has traveled across the globe fueling more hate against gay people? The media hasn’t helped either with hyperbole. In Hawaii, we celebrated the passing of the Marriage Equality Act several years ago. We did it because the people of Hawaii realized that we are all people and deserve equality and the right to be free of discrimination. The Democratic Party of Hawaii was the progressive folks supporting the passage of this law. It’s disheartening to learn that this same group of people who claim to be for the people and “progressive” have changed their tune by supporting the likes of the radical anti-GMO movement. The world is listening and watching us and we must be responsible for the information we share. No one should lose a family member because of hate. The hate needs to end and it starts by people taking responsibility for their actions. The Right to Know shouldn’t be used to misinform our fellow global citizen and fanning fears. Our leaders need to stand up for the truth and not emotional ideologies that sound appealing on the surface but have a toll upon a minority who deserve to live a life free of fear and discrimination. That right supersedes any right to know what’s in your food. Foster a world of love, not fear and hate. Do it for the sake of your children so they may have a better world. We owe it to them.